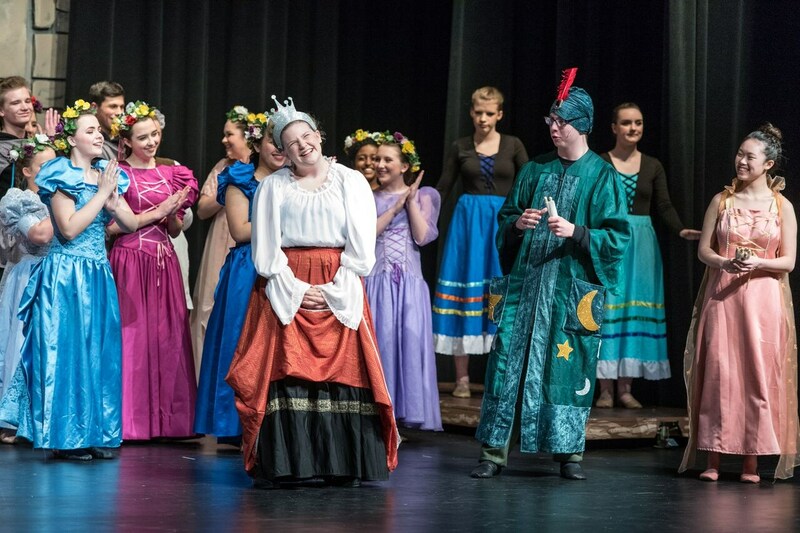 At Bishop Foley Catholic, we are pleased to offer multiple outlets for the performing arts. Bishop Foley Catholic High School has a highly recognized drama program. Foley is one of the few Catholic schools to put on four plays a year. The Drama Ensemble hosts a Fall Play, One Act Play, Spring Musical, and Student Run Production throughout the school year. The Drama Ensemble moderator and play director is Mrs. Mimi Lewalski. Drama at Bishop Foley Catholic is part of the curriculum as well as an after school club. Presents theatre history, introduction to technical theatre, scene development and presentation, and improvisation. Goes further in depth in the same areas and also covers script analysis and directing. The club is an opportunity for any student interested in theatre to have a chance to perform, work backstage or just be part of a club. The Bishop Foley Drama Ensemble presents four productions a year. Even if a student plays sports, there are plenty of opportunities to be part of a production. A varsity letter can be earned in Drama by accumulating enough points through club participation and being a part of any or all of the plays presented each year. The academic year includes four productions. The fall includes a one act production plus another play that alternates between comedy and drama. The spring includes a musical and student run production. Bishop Foley Catholic offers several classes for Performing Arts and provides multiple after-school clubs. All skill levels are eligible to participate in the clubs. The benefit of the music clubs is that the time slots still allow students the ability to participate in sports or other extracurricular activities. Learn more about extracurricular clubs and activities. This is an after-school extracurricular ensemble open to singers of all skill levels and voice types (soprano, alto, tenor, baritone/bass). This group prepares and performs music in conjunction with the Choir class for Christmas and spring concerts, as well as additional performance opportunities within and outside the school community (BFC Cookie Walk, etc.). Genres span from sacred music to secular such as Broadway, pop, rock, and jazz. The ability to read music is not a requirement to participate in this club, only the love of music and a desire to sing! This is an after-school extracurricular ensemble open to students who play a wind-ensemble instrument such as: woodwinds, brass, or percussion. Additional instruments like piano/keys, bass, etc. will be considered at the discretion of the director. Final decision depends on ensemble needs and sheet music/part availability. The group prepares and performs music in conjunction with the Band class for Christmas & Spring concerts. The club also has performance opportunities both in and outside the school community such as the BFC Open House, Cookie Walk, etc. Prior woodwinds, brass or percussion instrument playing experience of at least one year and ability to read music is required. Note: Students who do not meet the criteria to play in Band, but wish to express themselves musically, may consider joining Choir and/or Music Ministry. The ministry is the perfect place for students that like contemporary Christian music and singing or playing Praise and Worship. This is an after-school extracurricular ensemble that is open to singers and instrumentalists (piano/keys, drums, guitar, bass, etc.) who wish to contribute their talents praising God in song at all-school Masses, K-12 liturgies, and other paraliturgical events (Reconciliation, Adoration, etc.). Music is entirely sacred in nature and particular emphasis is placed on contemporary, praise and worship styles. This is an incredibly fun way to meet others interested in drama! The club meets monthly to discuss different aspects of theatre. A wide range of topics are covered. Topics such as: history, makeup, components of the performance, design and production. The Bishop Foley Dance Company is open to any student interested in dance. The dance company’s intent is to help students gain confidence, opportunity to learn more about different dance styles, give more experienced dancers a chance to choreograph if they desire, and increase the their awareness of themselves and space around them.